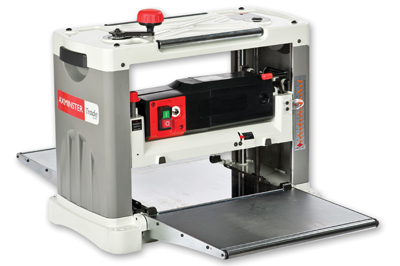 This is one of the Axminster bench-top machines that has been updated and rebranded, in this instance as 'Trade', which means it has a continuously high power rating and heavy-duty construction. The first task was to check the machine for accuracy 'out of the box' and a few adjustments were necessary. Firstly the outfeed table was level with the planer bed at the roller extreme but the actual table was around 4mm low at its inner end. Unfortunately, there did not seem to be any way to adjust this. The infeed table was too high and so the two hex-headed bolts that form stops had to be adjusted. 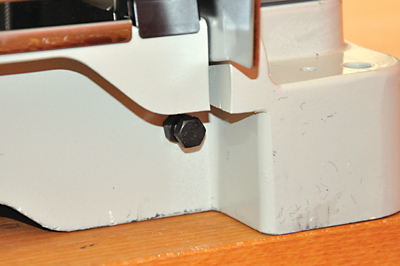 No tools are supplied to do this and unless the machine is positioned very close to the bench or support edge, they are very difficult to access; they are easier to reach if the machine feet are off the bench edge. This is not an unusual design and the JET JWP-12, also sold by Axminster, is the same. If you intend to permanently attach to any form of workbench, this may make adjustment an infrequent practice. 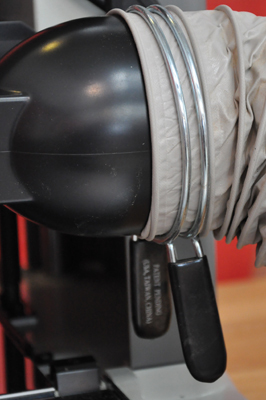 The chip- collector hood was installed using the three supplied pan-head screws, so not a simple on/off action, and if you want to save space in the workshop or transport the thicknesser around, you cannot fold the outfeed table with this in position. The cutterblock achieves 9,000rpm so the machine is quite noisy even when not cutting, but then most are. A piece of American curly oak measuring 150mm wide by 1.8m produced a good finish despite the slightly wild grain pattern. There was, however, snipe in evidence beginning about 50mm from the end, something that I struggled to avoid on every workpiece despite trying very light cuts and supporting the timber outfeed almost to the point of lifting it from the outfeed table. Although with light cuts this was only small fractions of a millimetre in depth, it is a problem if you want a good full-length finish. The anti-kickback fingers did seem extra stiff and I think they exert so much pressure that, as the end of the timber passes beyond them, the feed rollers do not continue to hold the timber down quite so tightly. Even a short piece of ash suffered the same fate and trying a false timber bed made no difference. The most substantial piece machined was a 800 x 50 x 200mm piece of sapele, and with the maximum cut I could achieve of 1.9mm, this went through with little hesitation. Passing through again on a minimal cut, the finish was quite acceptable and ready for final surface preparation. The cutterblock speed and feed speed combination produced no obvious 'scalloping' or undulations in the timber surface, which means that you can avoid hand planing in some cases before scraping or sanding. The other notable problem in use was the depth of cut. This is quoted as 3mm but I found the maximum was 1.9mm: trying for greater than this simply clamped the front edge of the cutter assembly frame onto the top of the workpiece. No matter what was changed, that was the maximum depth of cut. Adjustment of depth of cut was partly a hit-and-miss process as there was noticeable play in the depth-adjusting handle/mechanism. This is marked as one revolution equates to 1.6mm depth change - 94 full revolutions for the full range of cut - so a quarter of a revolution is 0.4mm or approximately 15 'thou' for us imperialists. I found I could probably adjust to within about 0.1mm - or 4 'thou' - due to the 'slop' in the adjustment but practice and familiarity might improve that. The cutterblock is 55mm diameter and has two HSS disposable blades, which are priced at Â£39.30 per pair. Removal or replacement was not attempted but as no setting is involved, it should be reasonably easy and quick to do. 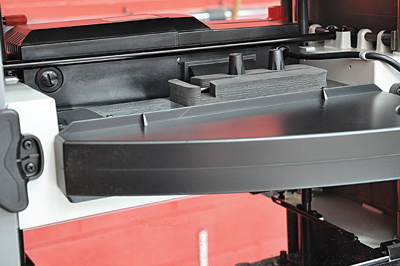 Easy accurate blade positioning is essential for precision thicknessing. As received, this machine produced a variation in thickness of only 0.05mm or 2 'thou' across the width of a 20mm thick by 200mm wide board, and as that was as the blades were installed at the factory, it bodes well for future blade changes. Potential to accurately adjust infeed and outfeed tables is limited and cumbersome to achieve, and the depth of cut was disappointing for a machine where the on-site ability to dimension softwood quickly would be expected. The height adjustment for the cutter assembly was by a non-locking lever that applies friction to the four support columns - a more positive means of knowing this has been done would be more reassuring in use. This is a nice-looking machine and firmly placed at the top end of the pricing structure for this format. As such it faces stiff competition from brands with an established reputation.